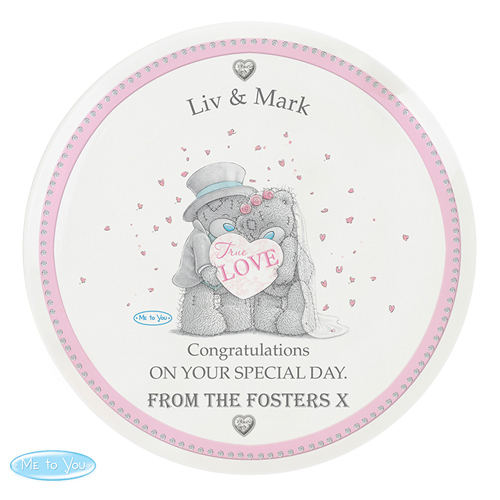 Personalise this "Me To You" wedding plate with a couples name up to 30 characters long at the top, and 3 lines of 20 characters each for a message beneath the cute married bears. "True Love" (in the heart) is fixed. Lines 1 and 2 will appear as entered and are case sensitive. Lines 3 and 4 will appear in UPPER CASE. Personalise with a couples name up to 30 characters long at the top, and 3 lines of 20 characters each for a message beneath the cute married bears.